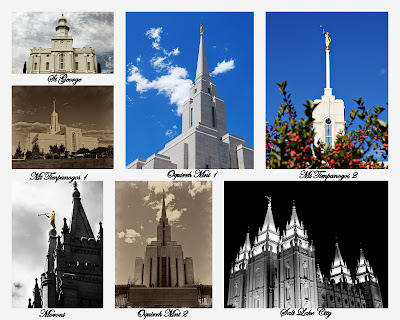 My friend, Rachel, asked me if I had some pictures of the temples that we could use for Relief Society. Members of the Church of Jesus Christ have been asked to have a picture of a Temple hanging in their homes. (There are three things you will find hanging on many Mormon's walls- A picture of Christ, as He is the center of our religion, a picture of a temple, and a copy of the "The Family: A Proclamation to the World." I had already taken some of Oquirrh Mountain and St George, but I didn't have any that I was really happy with of the Mount Timpanogos Temple. So, the other morning, I left early to work so that I could stop and take some pictures in the morning light. Then a few days later, we went to dinner up in Salt Lake, and we decided to take a walk around the Salt Lake Temple, so I could get some night pictures. Here are the ones we're using for Relief Society. The women get to pick what size frame their 8x10 print will go in, which temple picture they would like and if they want color, sepia or black and white. Those are beautiful pictures! Incredible!